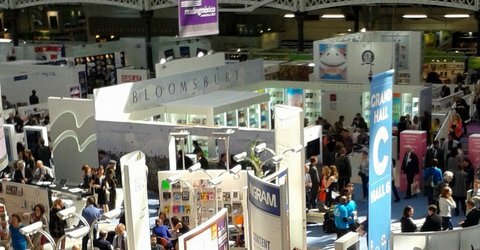 London Book Fair has a special place in my heart. Three years ago, when I was in the thick of my year of reading the world, I took a day off from work and ventured there clutching a long list of countries that I had yet to find books from. I had no idea what to expect and I’m sure I must have seemed like a crank to many of those I spoke to that day (the people at the Sultanate of Oman’s stand certainly weren’t impressed). Nevertheless, bumbling from stall to stall on the trail of national literary associations, publishers and agencies who might be able to help, I did make some useful connections. These included a fascinating discussion with Justin Cox from the African Books Collective, who ended up pointing me in the direction of several of my reads for the project. I came away from that day tired but happy, and clutching an armful of books. The great thing about the Book Fair, as I discovered that day, is that it is vast and diverse enough to have something to offer all comers (well, certainly all those who like books). If you want to spend the day finding out about threats to writers in authoritarian regimes, you can do that. Interested in the latest gizmos and reading accessories? Look no further. Passionate about Mexico? You’ve come to the right place (particularly as that’s the focus country for this year). Keen to find out how you can best self-publish and market your novel? Check. As a result, everyone does come, from the most tentative of aspiring newbies to great literary stars, and from one-woman back-room publishing outfits to the biggest names in the game. 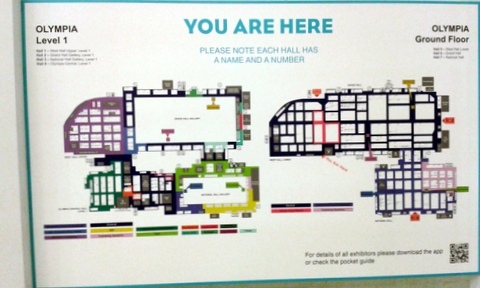 You’ll see them all: agents, authors, bloggers, editors, publicists, readers, translators and even a few lost tourists milling around under the great arched roofs of Kensington Olympia, holding meetings, sealing deals, helping themselves to sweets from little bowls on the end of counters, trying to work out where they are on the floor plan (see below), and generally talking, reading and thinking about books. This year, as I wasn’t on the trail of titles from particular nations, I decided to focus my attention on the packed programme of talks and events. So I spent yesterday flitting between small areas of seating with names like the English PEN Literary Salon, Author HQ and the Literary Translation Centre to catch as many things as I could. I covered a lot of ground. I watched interviews with leading Mexican writer Elena Poniatowska (who told me afterwards as she was signing my copy of her novel Leonora that she had been very nervous about speaking in English – it didn’t show) and bestselling British debut novelist Emma Healey. And I listened to a fascinating talk on whether television drama is the new literature – apparently not, I was relieved to hear, although the more fluid way that people consume stories these days (from short-form snippets to binges on box sets) has opened up the possibility for metanarratives that dwarf even the chunkiest Victorian novels. In extreme cases, these pose the risk that writers committing years of their lives to creating the screenplays for certain shows might burn out, a scenario that sounds almost Kafkaesque. I also caught a discussion on crime and thriller novels. According to critic Jake Kerridge ‘discussability’ is key to many such books’ success. And, by the way, if you have a crime novel or thriller on your computer that you think should be published, Harper Collins’ Killer Reads imprint is accepting unsolicited manuscripts until this Friday. 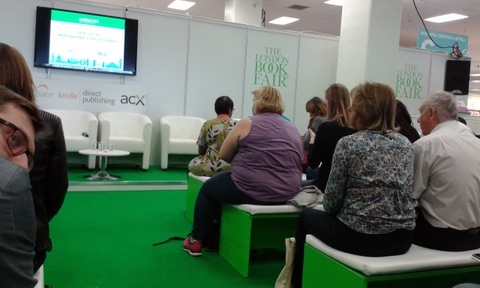 However, as I’ve found in previous years, the most interesting Book Fair events had to do with translation and the way books travel across borders (or don’t). I was intrigued by a discussion about ‘What Not To Translate’. The participants seemed to agree that while translators should not censor or control which works travel according to their personal political views, time pressures inevitably mean that they are more likely to accept commissions for books with which they feel a degree of sympathy. A talk on the role of literary agents in connecting continents was similarly fascinating, particularly as agents are still a relatively new concept outside the English-speaking world. The final event of the day was among my favourites. Bringing together translators Daniel Hahn, Deborah Smith and Ruth Ahmedzai Kemp, and Syrian author and illustrator Nadine Kaadan, it picked out the titles they had worked on for Reading the Way, a project by Outside In World to find, translate and try out children’s books from around the world with UK audiences. I was particularly taken with the sound of El cuento fantasma, a Costa Rican story that Hahn translated about a book in a library that is afraid of being read. 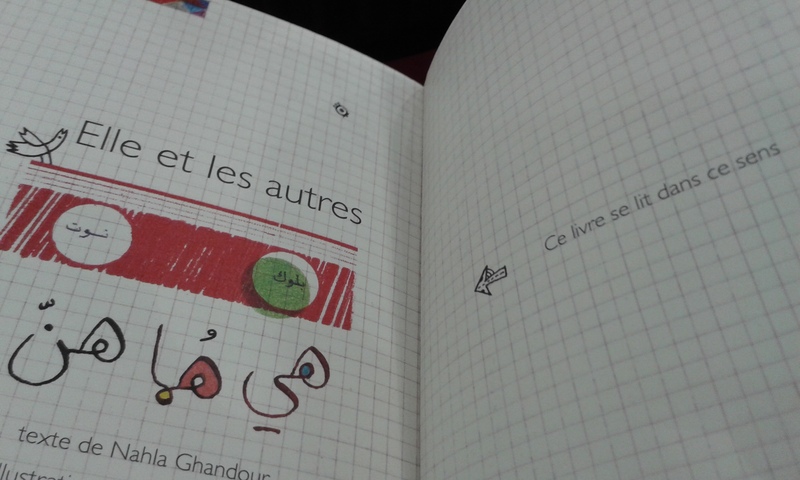 They also passed round a French/Arabic version of Elle et les autres by Nahla Ghandour, which, as you can see from the picture of the title page below, is read from right to left – an added challenge when you’re translating illustrated books from languages like Arabic and Hebrew into English because it means the illustrations may have to be altered too. But perhaps the best thing about the day was the number of friends and acquaintances I bumped into. From fellow writers and bloggers to people I’ve met through events and those who helped me read my way around the world, it seemed I could barely turn a corner without seeing someone I knew. It was a far cry from the experience of three years ago, when I wandered nervously around the stands, plucking up the courage to introduce myself. As I stood on the gallery of the main hall, looking down at the Bloomsbury stand and imagining what it will be like to see my novel Beside Myself there next year, it struck me once more how far this journey has taken me. 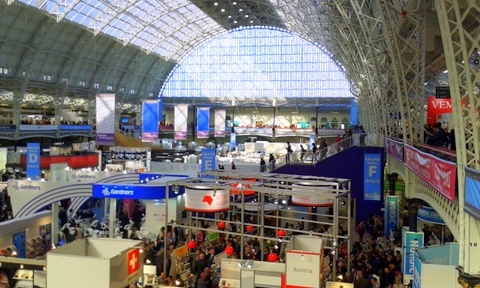 London Book Fair runs until Thursday April 16. With thanks to Literature Across Frontiers for giving me a ticket. I want to go !! I was there for the afternoon yesterday working, but I got an hour to wander about. It was my first time and so amazing and overwhelming- I was like a child in a sweet shop. Do you have any tips for first-timers? I know what you mean about the sweet shop feeling. Hmmn. Tips for first-timers. I would say have a clear sense of what you’re interested in and why you’re going (ie are you hoping to learn more about being a writer or translator, or are you involved in the book industry in another way) and then look at the website to see what events and stands there will be that would be most relevant to you before you arrive. Having a plan definitely helps make it feel more manageable – and of course you can always ditch the plan if something more exciting grabs your attention. Finally: enjoy! And be sure to drink lots of what. It gets pretty dry in there! Thanks for keeping us informed about what’s going on with the translation events. Wish I could be there. I really appreciated your mention of translators. I greatly value their job. Some of them are amazing Writers…I also think that some novels are improved by tranlsators. Though it is true that the original versions are always unique and worth being read in their authentic form. I too was interested in your observations about translation. As a student of Hungarian, I am very frustrated at how little of their literature is known in this country. I have massive respect for literary translators. It is a huge labour of love. I am currently translating three short Hungarian poems and it is taking forever. imagine translating a whole novel! Reading the world is a wonderful project.Bravo. It is indeed a rewarding and strangely intimate experience. As if you are stepping inside someone else’s head!